Bath towels or crowdfunded-honeymoon cash? Wedding guests dish on gift budgeting, what gets them to spend more (or less) and how they afford their own expenses. Shopping for a wedding present isn’t what it was 20 years ago. Sure, you can still buy a single place setting or a pizza stone from the couple’s gift registry, but they may prefer a contribution to their honeymoon fund, to a charity on their behalf or toward a down payment on their future home. Despite these modern options, most Americans would prefer to go traditional, wrapping their registry gift in white-and-silver paper and adding it to the gift table. Guests have a budget in mind, but may adjust up or down depending on circumstances — if they believe other guests are spending more, or if it’s a second wedding, for example. But the betrothed shouldn’t be disappointed — these budgets are generally quite healthy, and the newer, nontraditional gift options, such as crowdfunding a honeymoon, are still relatively successful on online registries. These are among some of the findings of NerdWallet’s most recent analysis. 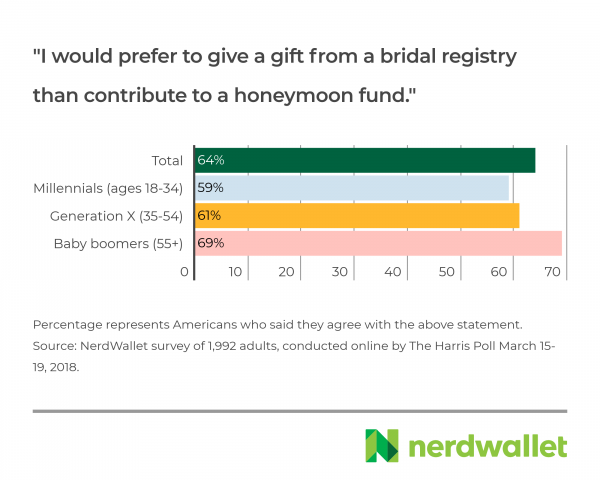 To see the cost of a wedding through the eyes of the guests, NerdWallet spoke with some of the top online wedding registry and honeymoon crowdfunding sites and commissioned a survey, conducted online by The Harris Poll in March 2018 among 1,992 U.S. adults. Weddings are fun and romantic, but the costly prospect of attending one isn’t quite so rosy. 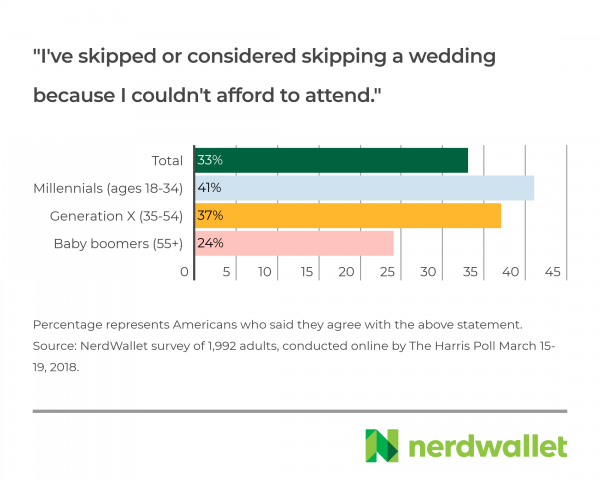 As a matter of fact, one-third of Americans (33%) say they’ve skipped or considered skipping a wedding because they couldn’t afford to go. Wedding guest budgets vary dramatically. 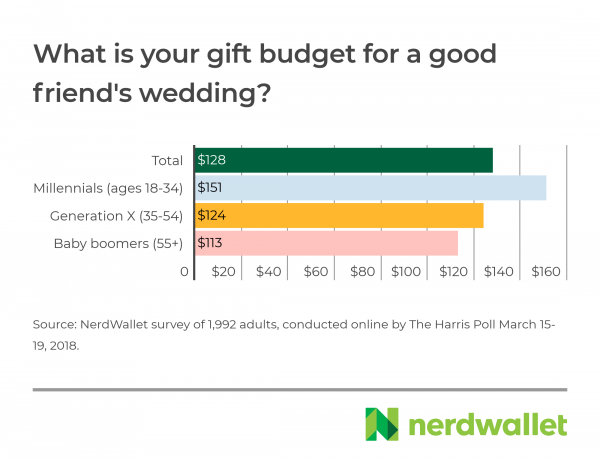 On average, Americans set their budget at $128 for the wedding gift of a good friend, but millennials plan on spending more ($151 on average) and millennial men budget the highest ($180), according to the survey. 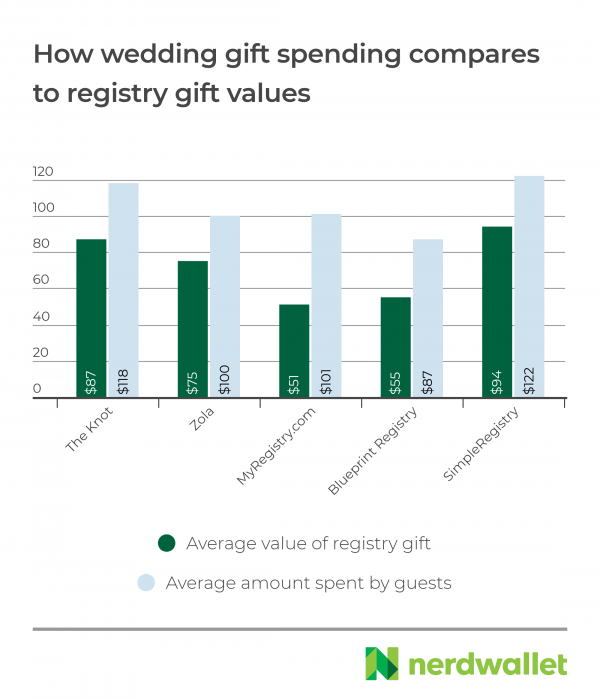 Registry spending indicates guests may give multiple gifts. Online wedding registries report registry gifts average $72, while guests buying from these wish lists spend $106, on average. Some guests consider the couple’s income when settling on a budget. Nearly 1 in 5 (18%) say they’d spend more than they typically budget if the bridal couple were less wealthy than themselves, while 5% say they’d spend more if the couple were more affluent. Couples are rewarded their first time down the aisle. More than a quarter (27%) of Americans would set their gift budget lower if it wasn’t the bride or groom’s first wedding. Most wedding guests prefer giving traditional gifts. Americans prefer buying gifts off a registry over contributing to a honeymoon fund (64%) or a home down payment fund (59%). And more than half (52%) say asking for cash in lieu of gifts is tacky. Paying for a wedding can be difficult, even for the guests. Roughly 2 in 5 Americans (39%) say they typically use a credit card to cover the costs associated with attending a wedding, and 15% say they take money out of their savings account. Nearly 1 in 10 millennials (9%) say they borrow money from their parents. » MORE: Need affordable wedding gift ideas? Start here. 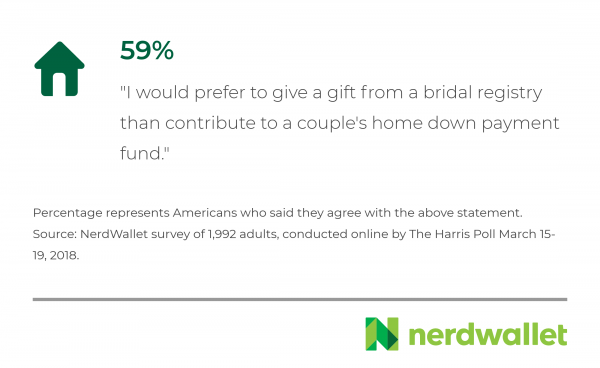 Americans are fairly generous when it comes to wedding gifts. They put their budget at $128, on average, for a close friend’s nuptials when attending the wedding alone. For some, this budget is higher. Millennials, defined here as those ages 18-34, set their budget at the top ($151), compared with Generation X, ages 35-54 ($124) and baby boomers, ages 55 and older ($113), on average. Millennials are most likely to see their peers married, considering the median age at first marriage is roughly 29 years, according to U.S. Census data. Men of all ages set higher average budgets ($143) than women ($114), and it’s the youngest men driving that figure up. Men ages 18-34 set their budget for a close friend’s wedding gift at $180, compared with women of the same age group, who aim to spend $123. According to data gathered from online wedding registries, the average price of a single registry gift is $72, and the average amount spent by guests shopping from those registries is $106. This could indicate that guests may buy multiple gifts to reach their budget target. Engaged couples may be trying to be conscientious about their guests’ budgets, by requesting items priced below the average spend. Wedding guests may set a budget in advance, but that figure isn’t always set in stone. Generously, 18% of Americans, including 25% of millennials, would spend more than they typically budget if the couple were less wealthy than they. Just 5% of Americans, including 9% of millennials, would spend more if the couple were more affluent. And 15% of millennials would do it to keep up with the Joneses; that is, if they knew other guests were spending more. » MORE: How much should you spend on a wedding gift? Most Americans who have ever been married have only tied the knot once. But 19% of both men and women who have ever been married have been married twice, and 5% have walked down the aisle three or more times, according to data from the U.S. Census. It’s quite possible these combined 42.5 million Americans saw their bounty dwindle with each passing wedding. According to our survey, more than a quarter of Americans (27%) say they would spend less on a gift if the wedding wasn’t the bride or groom’s first trip down the aisle. When setting the date, couples may want to consider what other expenses guests have at various times of the year. Just over 4 in 10 Americans (41%) say they’re likely to spend less on a wedding gift if the wedding falls during the wintertime holiday season. The dollar dance is one thing, but asking for envelopes of cash may cross a line for many wedding guests. 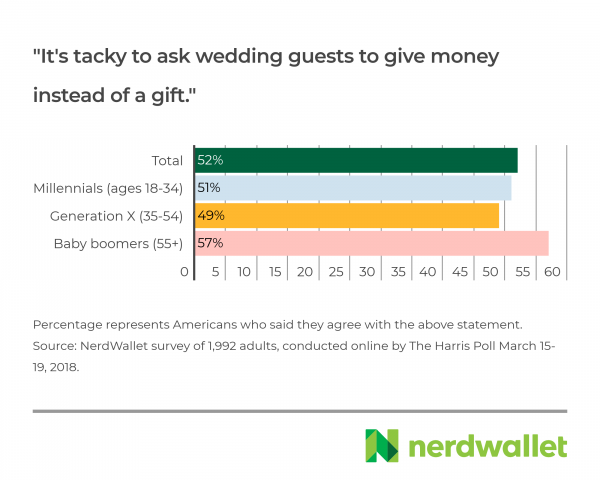 More than half of Americans (52%) say asking wedding guests for cash in lieu of gifts is “tacky.” This sentiment is most true for baby boomers (57%). Some registry sites now allow couples to start campaigns for their home down payment or remodel, but 59% of Americans say they would rather give a registry gift than contribute to such fundraisers. 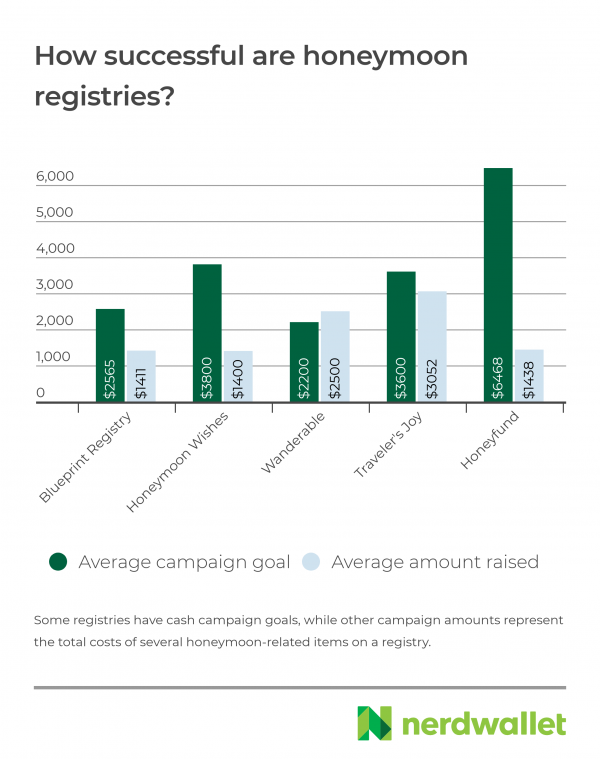 Blueprint Registry reports the average goal amount for such campaigns is $1,821, and the average amount raised is $766 — a 42% fulfillment rate. Wedding gifts aren’t always for personal benefit, however. Some couples make like Prince Harry and Meghan Markle and request that charitable contributions be made in their name. According to Blueprint Registry, these campaigns have an average goal target of $887 and raise $362, on average. 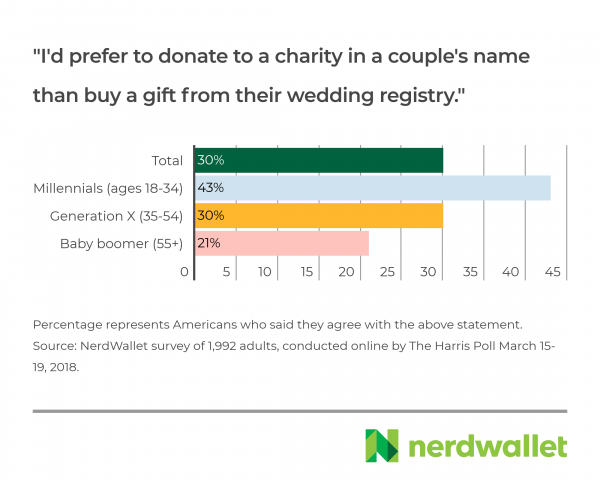 Millennials are most likely to prefer donating to charity over giving a traditional registry gift — 43% of this group say this was their preference, according to the survey. Most Americans (64%) would prefer giving a registry gift over helping fund the couple’s postnuptial vacation. But sites with honeymoon registries tell NerdWallet their popularity is growing, and money raised by these campaigns is enough to make a significant dent in the getaway’s final bill. How couples go about funding their honeymoon depends on the website they use. Some sites offer traditional crowdfunding campaigns, with a dollar goal amount, while others invite couples to itemize the expenses of their planned trip. Overall, these campaigns earn an average of $1,973, approximately 53% of what they set out to. Attending a wedding can be a stretch for many budgets, as demonstrated by the one-third of Americans (33%) who have skipped or considered skipping nuptials for financial reasons. When asked how they typically pay for all of the costs of attending a wedding, including gifts, the bachelor/bachelorette party, clothes, and hairstyling and makeup, more than half (52%) say they pay with cash or money from their checking account. But 39% say they typically put it on a credit card, and 15% say they’d tap their savings. Having a budget in place is the best way to plan for expenses like this in advance. The 50/30/20 budget is a good place to start, where 50% of your monthly take-home income is earmarked for “needs” like housing and food, 30% goes towards “wants” like wedding gifts and meals out, and 20% is put toward savings and debt repayment. The calculator below can show you how those numbers would break down for you. Then, anticipate your planned expenses for the month, so you can make adjustments to pay for wedding costs without turning to your parents or your plastic. For the purposes of this survey, millennials are defined as those ages 18-34, Generation X as 35-54 and baby boomers as 55 and older. Data provided by The Knot in registry spending graphic based on self-reported survey responses. Registry sites provided overall averages or annual averages of the last year available.